The third and final day of Bhakti Marga’s 10 Year Anniversary weekend was intense and packed full of activities. The morning kicked off with group yoga practices including Bababji’s Surya Namaskar and Atma Kriya Yoga followed by special Abhishek on Sri Swami Vishwananda's personal deities. Swamiji invited two visiting swamis on stage at the end, to offer arati to the deities, while Bhakti Sounds sang beautiful bhajans and kirtans. National groups had the opportunity to take photos with Guruji. Throughout Shree Peetha Nilaya, more than 600 people formed OM Healing circles, covering the ashram to form a Maha OM Healing experience. Many engaged in this ancient healing technique, which created an atmosphere that even those who were not participating felt immersed in its sphere of influence. Tours of Shree Peetha Nilaya continued into the final day. Newcomers and devotees could see the progress that the ashram and Bhakti Marga have made. The three day Tombola silent auction came to a close, the results were exhibited and buyers secured their prizes. A unique “wish-fulfilling” or, “Kalpa Vriksha” tree planting ceremony took place in the front lawn, where many gathered to hear Swamiji explain . Beautiful opera pieces sang by Nami (Namrata Shah) and Vikash (Stephan Müller) accompanied the planting ritual. 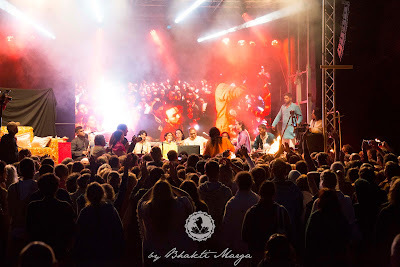 Rishi Nikhilananda's brief speech captivated the audience as he officially announced that Sri Swami Vishwananda’s Ten Year Anniversary festival marked Bhakti Marga's first annual Just Love festival. He also announced the upcoming creation of the Bhakti Marga Academy, where devotees will be able to learn a wide variety of topics, from Swamiji's teachings, to religions like Hinduism and Christianity, and even practical courses like Vegetarian Cooking. The evening comprised of numerous performances by international Bhakti Sounds groups with a dance routine, by Bhakti Sounds Latvia, Croatia, England, and Mauritius all had an opportunity to share their distinct takes on Hindu bhajans. A “jam” session consisting of Bittu Mallick, Karthiegasen, and Bhakti Sounds completed the day full of events and a well-received, unforgettable festival celebrating Sri Swami Vishwananda and his mission. We all watched a compilation of the #LoveChangesEverything video campaign productions, and then heard from each of the swamis and swaminis of Bhakti Marga, as they shared their heartfelt gratitude and respect for Guruji, Sri Swami Vishwananda, in his constant work to bring us further in the Path of Devotion, Bhakti Marga.